On Monday, the deaths of 19 innocent souls changed Qatar forever. The change in atmosphere here is marked, and there is a tremendous amount of anger mixed with an enormous amount of grief. When tragedies like this happen our instinct is always to want to do something, anything; my profession meant that I was privileged to be asked to contribute to coverage of the fire in the UK’s media. I acted as the BBC’s reporter in Doha throughout, doing several interviews with the BBC News Channel and BBC World TV, and an interview with Radio 5 Live. I also wrote a short analysis box for the story on the BBC’s website. Click here to read the article – one of the interviews I did with the BBC News Channel is the media at the top of the story. Additionally, the Telegraph asked me to write a piece the day after the disaster, explaining how Qatar’s community is feeling. Click here to read it. 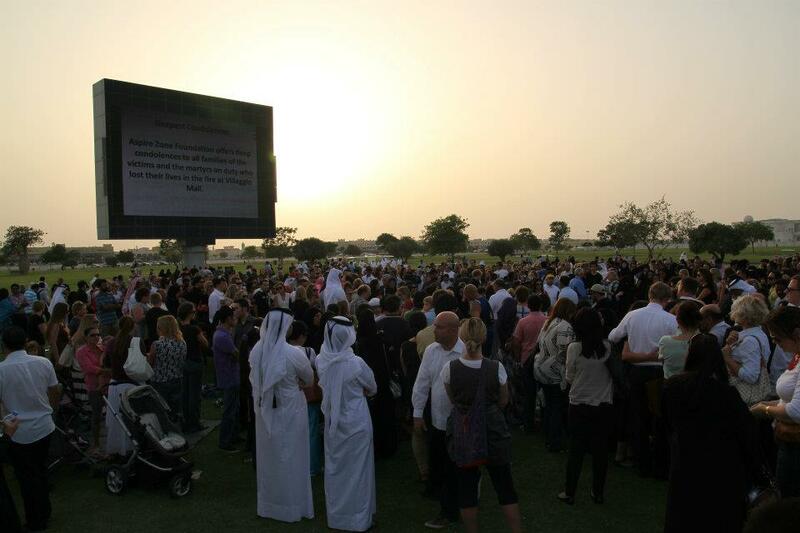 The picture above is one I took at the vigil in Aspire Park the day after the tragedy. The cross section of the community attending was remarkable, and a real testament to the unity we are all feeling. As I wrote in the Telegraph – we are truly united by our anger, and by our grief.